2016 - Global eBook Gold Medal - Mice & Spiders & Webs…Oh My! 2016 - FAPA President’s Award - Bronze Medal - Mice & Spiders & Webs…Oh My! 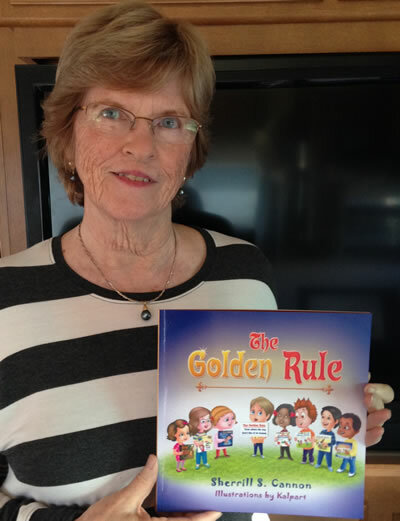 2016 - Pinnacle Achievement Award for The Golden Rule! 2015 - Reader’s Favorite H.M. - Mice & Spiders & Webs…Oh My! 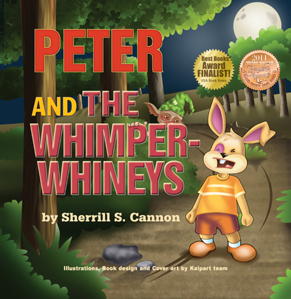 You will love the lively characters in Sherrill’s books, such as "Peter, the rabbit who meets the Whimper-Whineys. A psychic medium once said that if you find a random dime, it is a sign that someone that you have loved and lost is thinking of you. 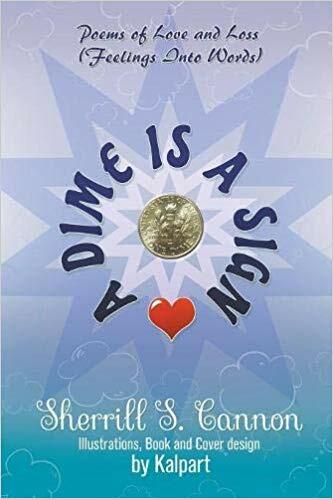 Sherrill S. Cannon's second book of poetry contains messages written through the years in poetic form that put feelings into words. As a teacher, many of her poems helped counsel troubled teens and friends. 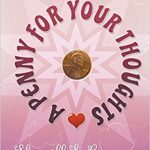 There are three sections in the book: Heads, Spinning, and Tails ... (Love & Loss: Coin Toss?). The variety of lyrical poetry forms include free verse, blank verse, haiku, and sonnets, while some are just playing with words! Hopefully, this is also a book of healing. Have you ever loved, been loved, been confused about love, or suffered from loss of love? All these feelings have been captured and shared in the words of heartfelt poems, compiled over many years by a former teacher and award-winning author. 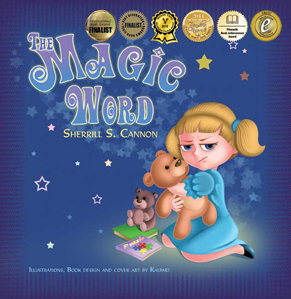 Sherrill S. Cannon now shares her thoughts in this book of feelings. "As a teacher, I used poetry to help counsel many troubled teens and friends, and have continued this pattern throughout the years." Does your child have a Guardian Angel? Share a day in the life of a little girl whose tiny guardian angel named Angela sits on her shoulder to keep the child safe and guide her through the day. Her activities include getting ready for school, crossing the street, being polite and kind to friends, learning her lessons, fastening her seatbelt while traveling, being aware of stranger-danger, praying for her pets, and reminding her constantly that she is loved. No one likes a whiner! Finally, a children’s book to help parents cope with whining and complaining children. Peter is “a very small rabbit who did nothing but whine.” And of course, no one wants to be around anyone who is always whining, so Peter is not a very popular rabbit. Is your child a good listener? Rosemary is a little girl who is worried about returning to school after her teacher warns the class that they would soon have some mice, spiders, and webs in the classroom. Could Rosemary have misunderstood something? With Christmas around the corner, it is easy to get caught up in the hustle and bustle of shopping to catch the best deals of the year, but have you ever stopped to ponder how Christmas is about both Santa and Jesus? 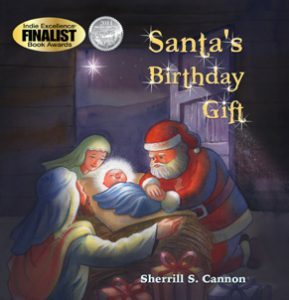 Author Sherrill S. Cannon has the answer. What should a child do when no one wants to come to her birthday party, and she fears she has no friends? Elisabeth needs to learn The Magic Word and to use it every day. It’s a word that everyone needs to use! 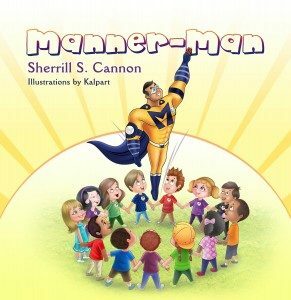 Manner-Man arrives, shouting “To the Rescue”, helping children learn about sharing and warning about not ‘hitting with words.’ He teaches that if someone starts pushing, just shout out “not nice!” Meet the children who form the Manner-Man team and find out how to join! Have you ever seen a “work of art” worth millions, which looks like something your child just brought home from school? 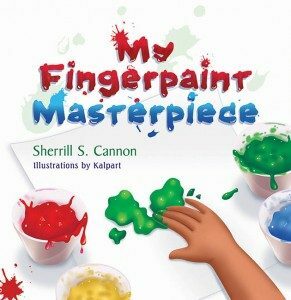 The dual perspective of “Beauty is in the Eye of the Beholder” and just a little bit of “The Emperor’s New Clothes” is evident in this clever artwork story of a child who paints a fingerpaint print in class and then loses it in the wind on the way home. What if you treated others the way you’d like to be treated? What if everyone did that? What kind of world could there be? 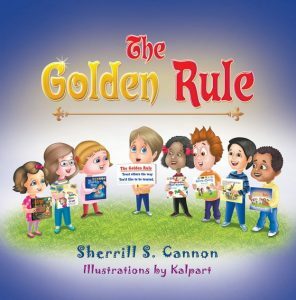 Robert and Kait decide to look for the golden ruler that their Mom has told them about, only to find out that she meant RULE instead of ruler.